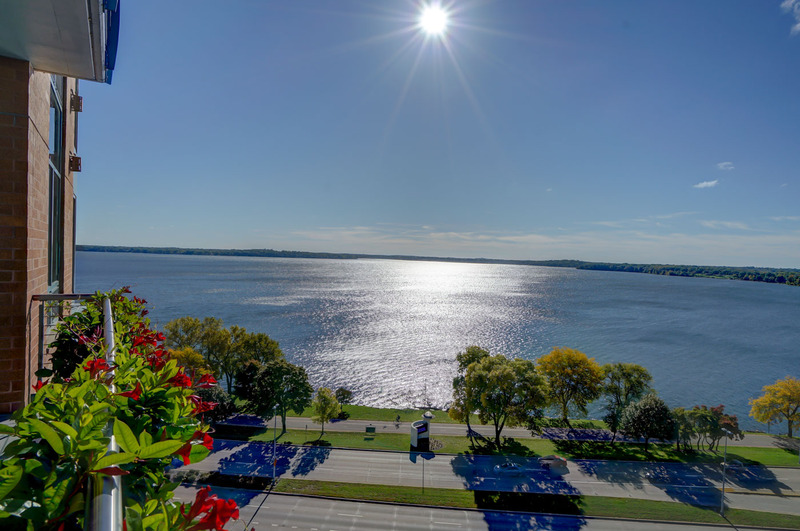 Have you ever thought about living in downtown Madison? Close to the hustle and bustle, where you can walk to the many restaurants, the culture, the lakes and the Saturday Farmer’s Market? Here’s your chance. 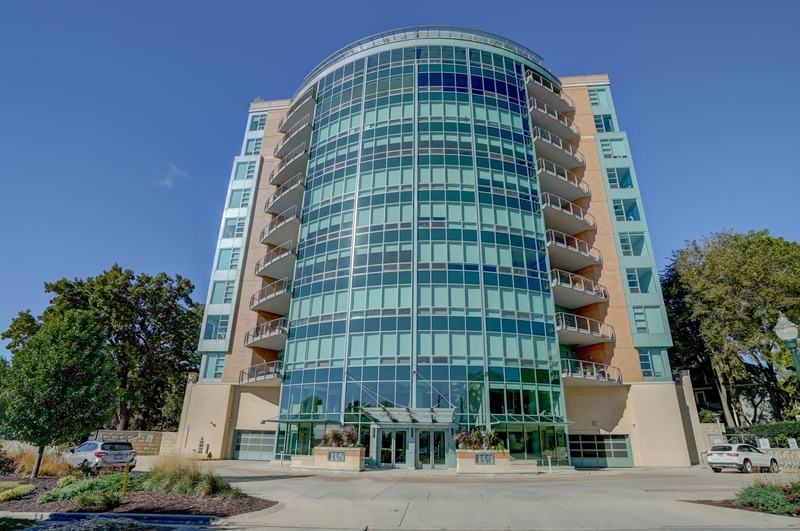 Nolen Shore is a luxury 11-story high-rise condominium conveniently situated at the quiet end of South Hamilton St., just a short walk from the Capital Square. The glass and brick tower is striking in its beauty. Step into Unit 902 and you’ll find more of the same. 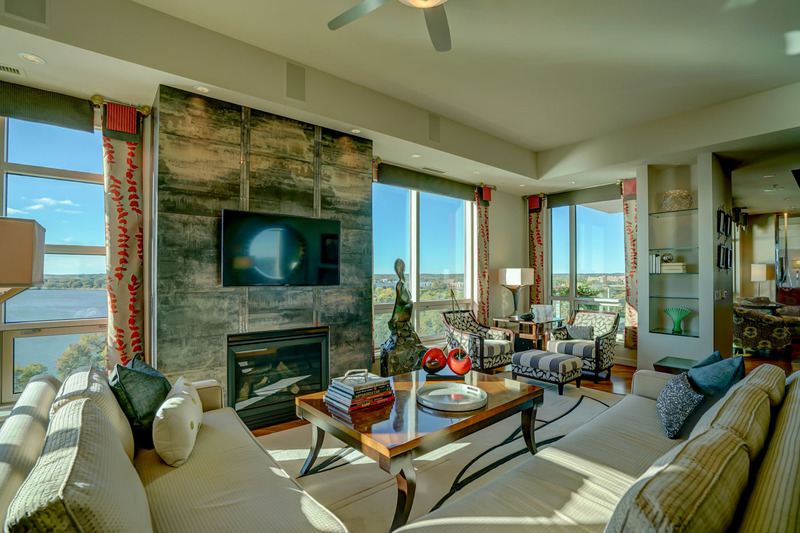 This 2,461 square-foot condo features 2-bedrooms plus office, and 2.5-baths. In the front entry, gun metal metallic-tiled walls and unique Brazilian Rosewood flooring mix warmth with style. To the left, there’s a double-doored coat closet and a generous utility laundry room, unique in its own right. In addition to the washer and dryer, there’s a pantry, custom shoe cabinet, sink, counter, utility closet and even an extra refrigerator. To the right of the entrance, you’ll find a powder room that’s not only practical, but show stopping. Red-tiled floors, artistic wall treatments, and a beautiful bold sink come together for a spectacular effect. Walking straight ahead past the kitchen (we’ll come back to that), is one of the main reasons that people choose to live here. And that’s the view. The breathtaking view. 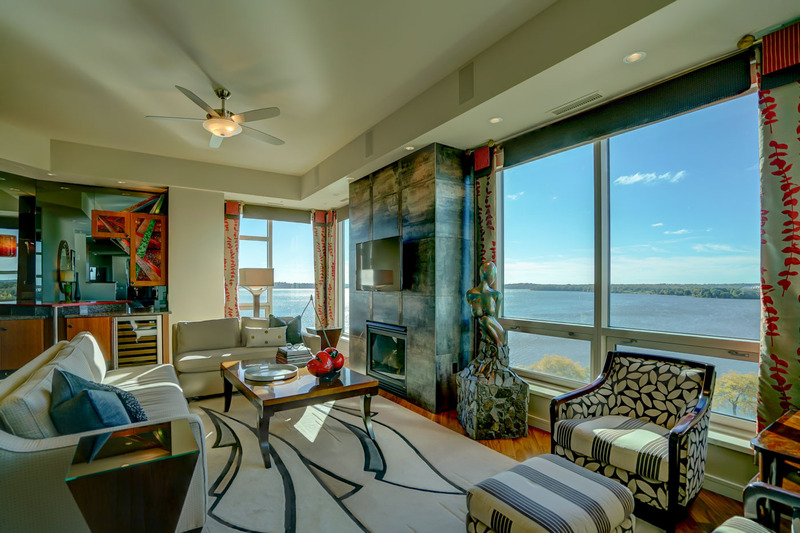 An expanse of windows here and throughout the condo reveal a panorama highlighting Lake Monona, the Isthmus, Monona Bay, Dane County Coliseum, the UW campus and the Monona Terrace. 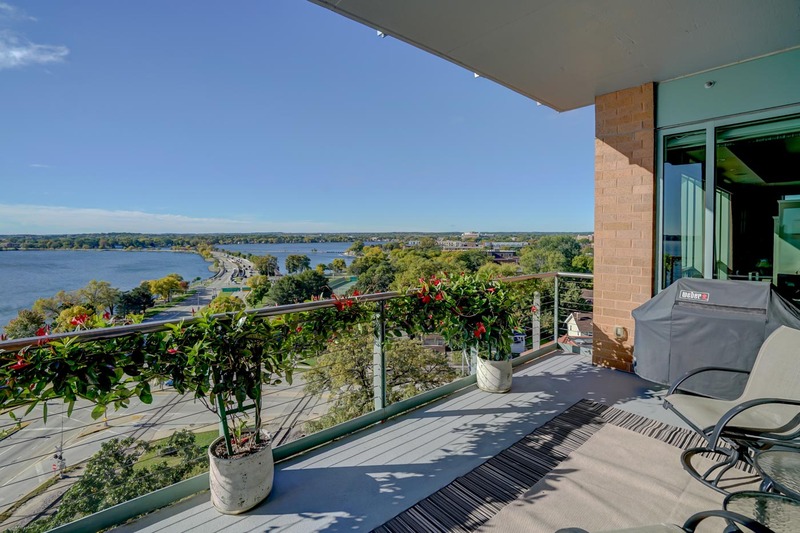 From here you can step out on the oversized patio where there’s plenty of room to sit and enjoy the view with your morning coffee or a late afternoon glass wine. If you love a good cook-out, you’ll be happy to know that the direct-line gas grill included. Back inside, the gourmet kitchen is designed with a hidden cabinet-front Subzero refrigerator and shelf freezer with ice maker, along with a GE Monogram double oven. There’s a custom glass and granite backsplash which perfectly sets off the Black Galaxy granite countertops. Maple cabinets are enhanced by beautiful oversized handles and soft-close drawers. 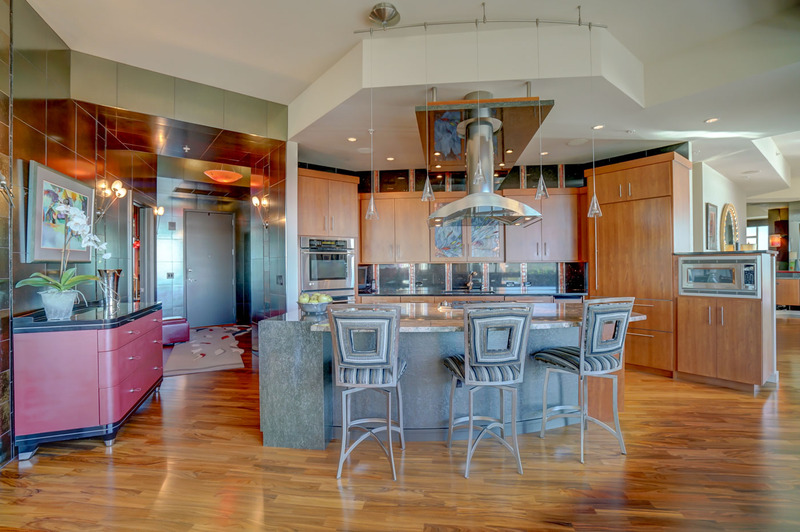 And a large granite island breakfast bar is home to a gas cook top — with plenty of room left over to seat four. Just pull up a chair for a snack, a meal or simply to chat with the cook. 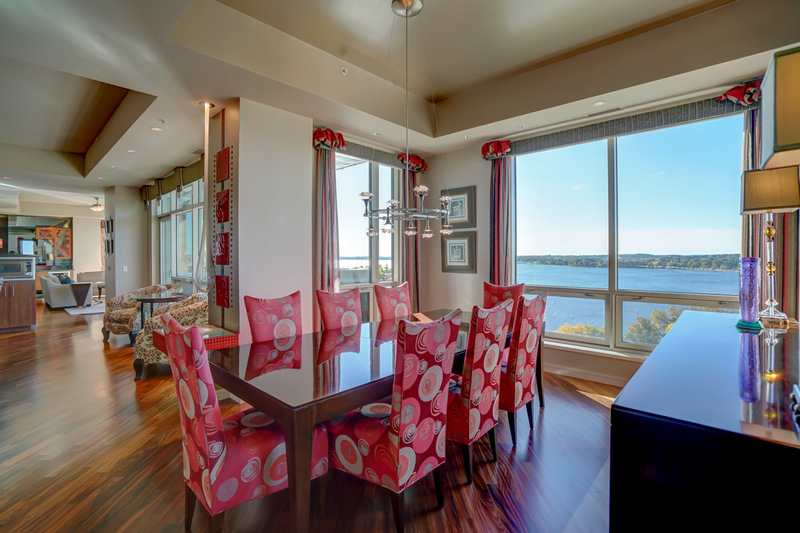 If you prefer to read or take in the view, you can have a seat in the adjacent kitchen sitting area near the patio. The quality design and craftsmanship are both noticeable throughout. 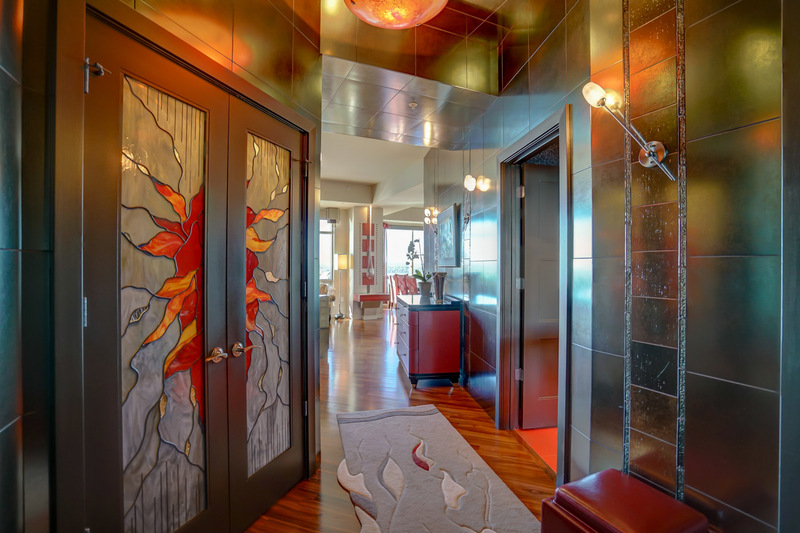 The condo’s interior, including its unique stained-glass — which was custom-made by Light Haus Glass of Madison — was designed by the late Rita H. Britt and featured in magazines. In addition to the distinctive glass and flooring, you’ll find 6-panel doors and enamel woodwork. When the sunlight gets too bright, you can lower the light-filtering IntelliFlex automatic blinds which are separately controlled from every room. From the kitchen, a wide hallway leads to a separate dining area large enough to seat 10-12 guests. Just beyond that is a corner office with a built-in companion desk, countertop and bookshelf all made of poured concrete. The open concept office is framed by windows on two sides, with access to both the hall and dining room. A pleasant place to work or watch TV. 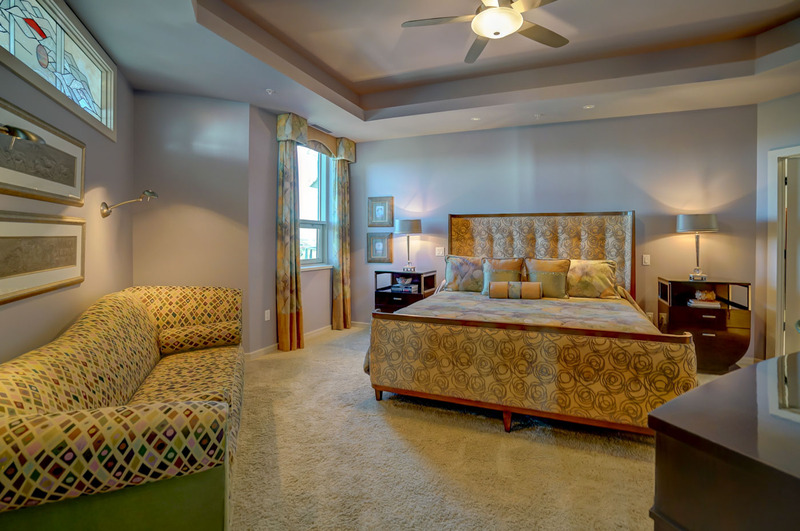 The generous-sized master bedroom is carpeted and brightly lit. It includes a large walk-in closet with custom organizer, built-in ironing board and sliding full-length space-saving mirror. A pocket door leads from the bedroom into a spectacular master spa bath with floor to ceiling tiles, separate sinks, granite counters, and a walk-in 2-headed shower with a pebbled floor and wall sprays. A true work of art in the form of a unique bath chandelier hangs above a jacuzzi tub — and stained-glass windows at ceiling-level lets natural light into the room. And there’s plenty of built-in storage. The second bedroom is also a generous size — and offers a large closet with bi-fold doors and custom organizer. An ensuite bath with granite countertops, vanity storage, and huge soaking tub/shower combo are all part of the amenities. And last but not least, as they say, is the oversized great room. Amenities here include built-in glass shelving, large windows (with a view, of course) and a gas fireplace surrounded by tiles and glazed metal accents. Mounts are set into these tiles for easy TV viewing. Smoked mirrors in the corner expand the space. Entertaining? No problem. The great room has its own serving bar and wine fridge. If the condo — with its location and view — isn’t enough by itself, the building has a community room with kitchen for its residents to use. Whether it’s for book club, a birthday celebration or Super Bowl watch party with fellow residents, it’s a perk that you’re sure to enjoy. And in addition to all the attractions you’ll find around the Square, pet owners will be happy to know that there’s also a dog park just a half block away. All in all, there’s simply no reason not to love this condo! 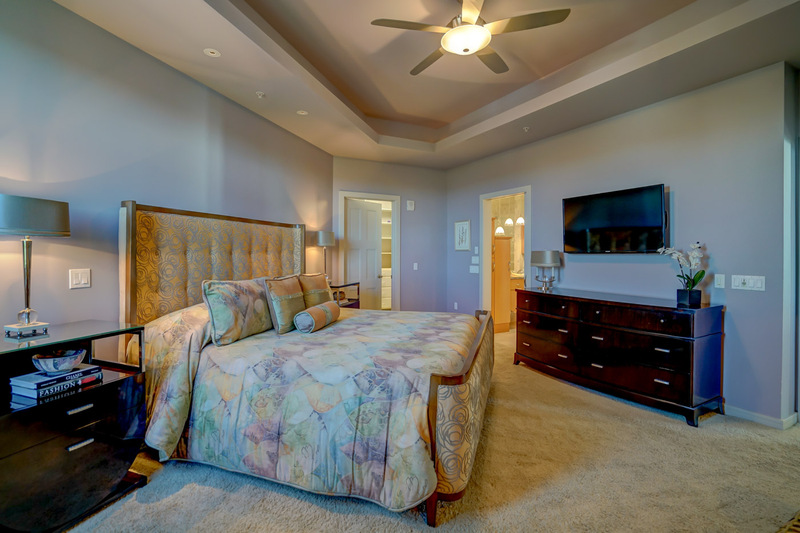 Why not make it your next home? 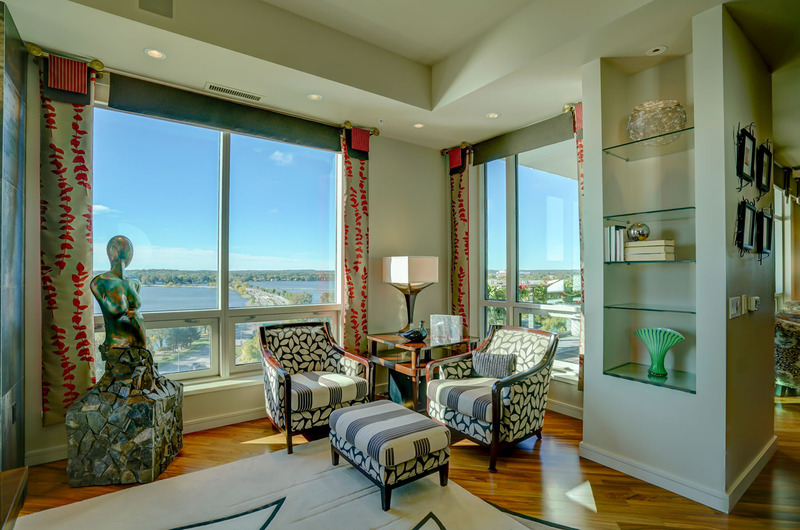 Contact me today for your personal tour of this gorgeous downtown condo!